Hotel management can include Hotel & Restaurant management, Cruise Ship Hotel management, Hospital Administration and Catering, Hotel and Tourism Associations, Airline Catering and Cabin Services, Club management, Forest Lodges, Guest Houses amongst others. There is a large variety of entry level jobs and career opportunities available in hotels and resorts, management and non-management jobs alike. In an industry where the ability to provide great guest service is more important than anything else, strong work ethics and an outgoing personality are often valued more than a college degree or years of experience. 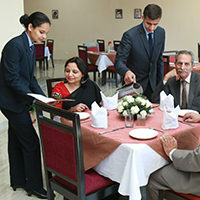 The hotel and tourism business attracts a lot of friendly personalities. These are people who enjoy meeting and working with others. 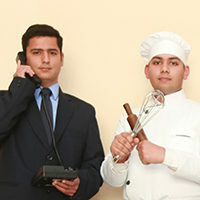 Workers employed in hotel jobs are there because they know how to be polite and accommodating to guests. In a healthy workplace, it’s only natural that these traits carry over to how employees interact with one and other. 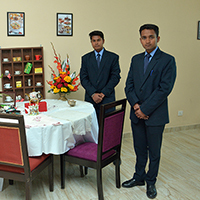 Greeting and serving new guests every day keeps hotel professionals in a pleasant, outgoing and social mood. Finding a new job or pursuing a new career in a hotel is a great way to make new friends and build long lasting work relationships. A hotel is a tight knit community of workers and professionals of various trades. Whether employed in a job department such as engineering, human resources, sales, or IT, working in such close proximity of professionals in other departments allows you the opportunity to learn new career skills and pursue new job titles and careers vastly different than your own. Benefits job seekers qualify for while working for top hotel employers like Marriott and Hilton can include medical, maternity leave, vacation pay, tuition reimbursement, and retirement packages. Hotel professionals get additional benefits and luxuries that workers in other industries never get the opportunity to enjoy.